I guess there are lots of people who buy fridge magnets. Do they really keep them on their fridge because this is what their name says? What when the fridge becomes too small? Should I buy a new, bigger fridge? I'm obsessed with fridge magnets, I really am. It all started in 1998 in Liechtenstein. I was on a school exchange in the Swiss town of Buchs and we went on a half-day trip to Vaduz, the capital of this tiny state of Liechtenstein. I wanted to buy a souvenir and there it was, a simple magnet with the royal palace on it. It remained the only magnet on my fridge for a very short time, because soon after that we returned home from NYC with an array of magnets: the Statue of Liberty, an apple, a yellow cab, a licence plate. 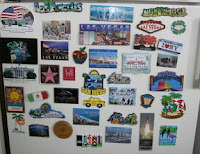 Today, my fridge is almost all covered with magnets that we've bought on our trips. We can't resist buying them. For instance, although we already had two magnets from Munich, we bought three new ones on our recent trip there: one with the Allianz Arena, one with the Hofbrauhaus and its bier and one with FC Bayern logo, which is also a bottle opener. Only two have been given to us - one from Kranjska Gora, a ski resort in Slovenia (but we were there a long, long time ago) and the other from Cancun, Mexico. We've been to Mexico, but stayed only for a few hours in Tijuana.